I am a French student who has a duty to create a paper about biohacking from a philosophical and ethical point of view. My questions are simple they mainly concern the moral aspect that poses problem for many people. Why did you use biohacking? -If you were to convince someone to have resorted to biohacking technology, what would you say? -If you were to defend yourself against an opponent of biohacking technology, what would you say? That's all for me thank you for having lend attention to my request, sent me your answer if you want, not necessarily about any question but the one you deem most interesting! Thanks again and sorry for my English, in France we are not very gifted ...Enjoy ! 4. I wouldn't even try to convince people to try biohacking. Just like pickles or garlic. If they don't like it, no big deal, don't bother people. 5. Given that a pretty large percentage of people already have implants the moral arguments are pretty much nonsense. Dental implants, pacemakers, artificial joints, heart valves are just a few of the very common implants especially older people have implanted en-masse. I observed that people quickly change their mind if they are confronted with the personal choice of either getting an implant, or dropping dead due to a failing part of their body. note: the difference between medical implants and diy implants aren't quite as big as one might think. For me, biohacking is a mentality of improving myself, for personal reasons, through technological means. It also carries a sense of community and openness for safety and collaboration. I started biohacking because I liked the idea of expanding my senses. 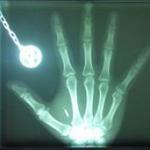 My magnet implant has served me at work and in my private life. Magnetic field sensing is practical in my line of work. I am an industrial electrical engineer. 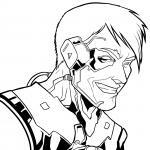 Robots are purely artificial, but biohackers are mostly flesh. Media doesn't show much cross-over between the two. I like showing people what I'm capable of as a biohacker. The people who want to participate don't need to be convinced. I have had to defend myself against people who were opposed to my right to upgrade. When people argue that this is against nature or their right to keep their body intact, I assure them that my right to modify my own body extends equally to their right to keep their body unmodified. When people argue against biohacking, I listen to their concerns. Most often, they are shocked because it is too far from the norms of our society. When they use religious beliefs, I face those because I know the passages they're referring to, and my augments have nothing to do with those scriptures. Most people who are scared of biohacking are afraid and while they probably can't be convinced, listening to their arguments and understanding them, goes a long way in showing that you're just as human as they are. Ears work better than mouths in these cases. There are also the cases of people who believe they have been implanted against their wills. They carry this belief without evidence and ignore evidence to the contrary. These people are in need of psychological help beyond what I am qualified to give.